Not only does this handsome table provide a place to hide your watering can and gardening supplies, but its a perfect place to show off your favorite cacti and succulents. 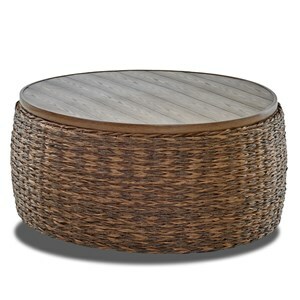 This outdoor end table features chunky-woven wicker in an inviting, multi-tone color scheme. It's completely durable and weatherproof with a construction of polyethylene wicker and a faux wood top made from aluminum. The finish detailing on the metal top is incredibly realistic and lifelike; it looks just like slatted wood. Lift the top to reveal hidden storage inside. 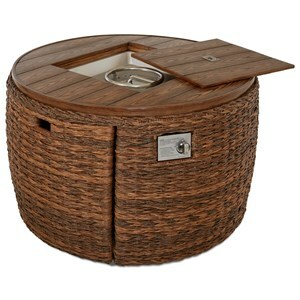 The Lantana Round Outdoor Wicker End Table with Embossed Metal Top and Hidden Storage by Klaussner Outdoor at Hudson's Furniture in the Tampa, St Petersburg, Orlando, Ormond Beach & Sarasota Florida area. Product availability may vary. Contact us for the most current availability on this product. Warranty Outdoor furniture is covered by a seven (7) year limited warranty. 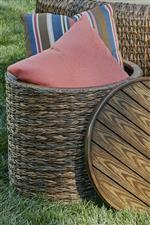 Maintenance All-weather wicker can be cleaned with mild soap and water. For best results, avoid abrasive cleaners. For outdoor fabric cleaning, spot wash with mild soap and warm water using a sponge or soft brush or simply hose down regularly. If you choose to machine wash your casings, select the gentle cycle and air dry. Do not use a clothes dryer. 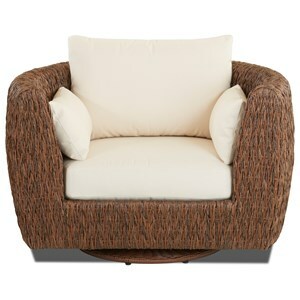 This collection boasts all-weather wicker in a rich textural weave. The textural look is totally on-point with the revival of retro decor trends like macrame. Adding durability and a nature-inspired touch are tables topped with mock wood slats embossed on sturdy aluminum. The result is outdoor furniture that can be boho, tropical, rustic, or casual. However you style it, these pieces will make fabulous centerpieces for entertaining outdoors. 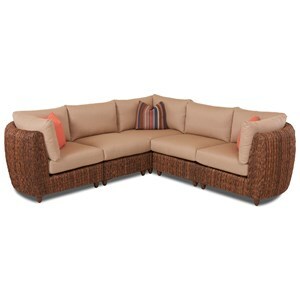 The Lantana collection is a great option if you are looking for Casual Tropical Outdoor Furniture in the Tampa, St Petersburg, Orlando, Ormond Beach & Sarasota Florida area. 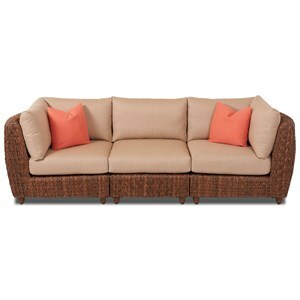 Browse other items in the Lantana collection from Hudson's Furniture in the Tampa, St Petersburg, Orlando, Ormond Beach & Sarasota Florida area.